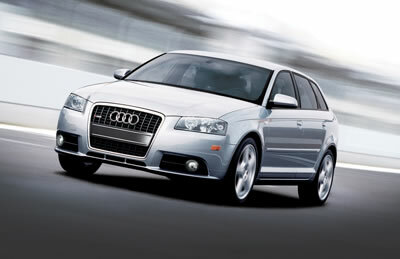 The A3 2.0 T is being joined by a new A3 3.2 V6 with quattro® all-wheel-drive. With its aggressive styling, sporty driving dynamics, and abundance of standard features, the A3 offers TT-like performance and sophistication with the versatility of its four-door design and cargo area. Together with the two 2.0 T FSI variants, the new drivetrain brings the number of A3 models on offer to three. This even sportier alternative is producing 250 hp with 237 lbs. ft. of torque available from 2,500 to 3,000 rpm. The 3.2 V6 is combined with quattro all-wheel drive and the much-praised DSG transmission already known from the A3 2.0 T models and the TT 3.2. The new 2.0 T FSI engine powers the other two A3 variants. The 2.0T FSI is a four-cylinder engine with turbocharger, delivering 200 horsepower. Its maximum torque of 207 lbs. ft. is available across a wide speed range from 1,800 to 5,000 rpm. Fitted with the 2.0T engine is a six-speed manual gearbox or optional sporty Direct Shift Gearbox (DSG) automatic transmission, both in front-wheel drive.